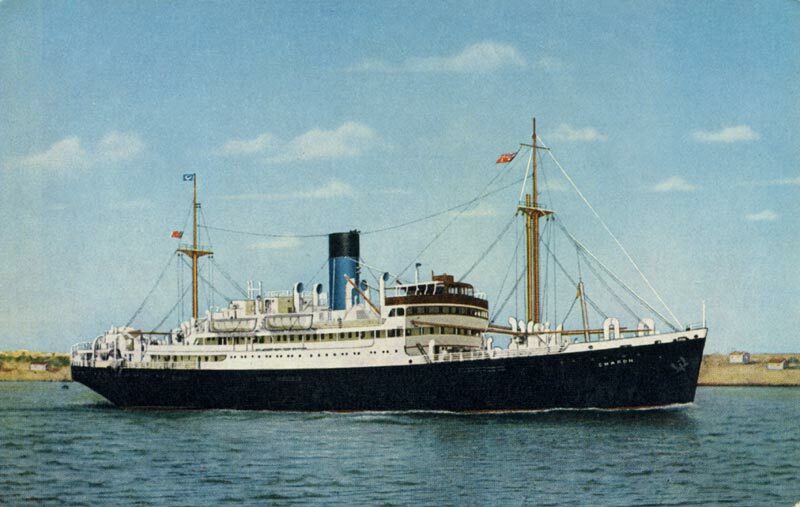 In the early sixties, Blue Funnel placed an order with John Brown & Co to build the Centaur for their Australia Singapore service, she replaced two ships on that run, the Gorgon built 1933 and scrapped 1964, Charon built in 1936, also scrapped in 1964 (see photo). 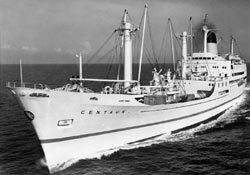 Centaur featured a long forward deck and a high aft superstructure. This, combined with her tall streamlined funnel gave her an unusual, but attractive profile. She had accommodation for 196 one class passengers, she also carried up to 700 head of cattle or some 4,500 sheep in her tween decks, she was built with a strengthened hull in order to cope having to sit on the bottom at an even keel at low tide, when loading at Broome or Derby (Western Australia) both these ports had extreme tidal ranges. 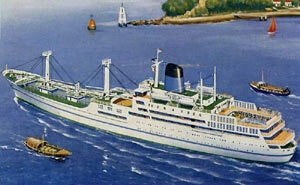 Built for £1.5 million, Centaur was launched on June 20, 1963 by Mrs. 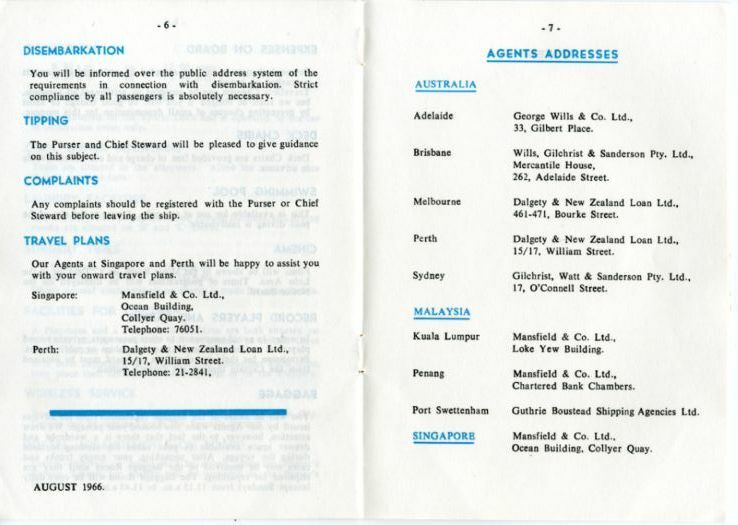 Brand, the wife of the Western Australian Premier. 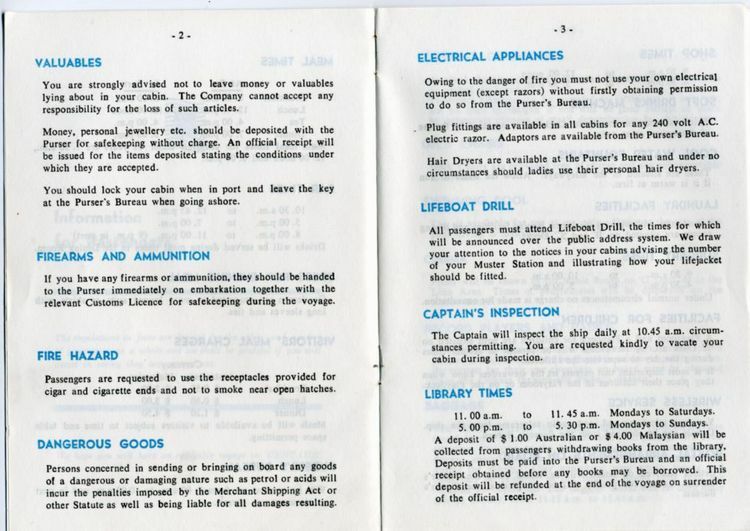 After her official handover in January 1964. 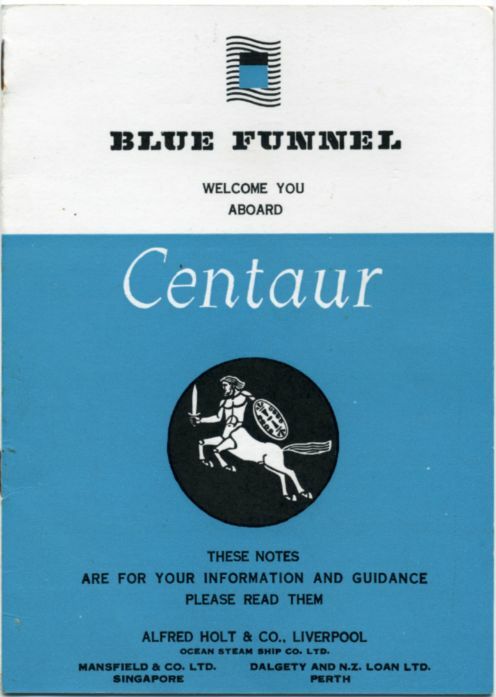 Centaur sailed from Liverpool on January 20, 1964 for her maiden voyage to Australia, sailing via the Suez Canal to Singapore, after which she headed for Sydney where she arrived on February 23. 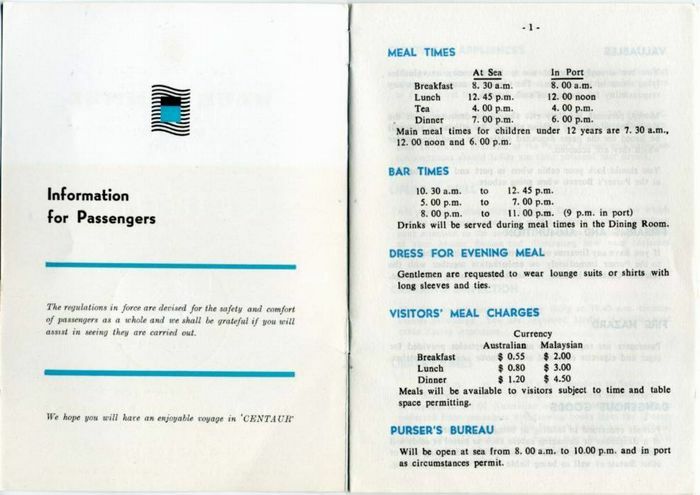 Centaur departed Fremantle on May 27, 1964 for Singapore, Port Sweattenham and Penang, she sta but as passenger numbers between Australia and Asia were declining, Centaur was taken out of service in 1982. On September 15, 1982. She left Fremantle for her final voyage to Singapore. 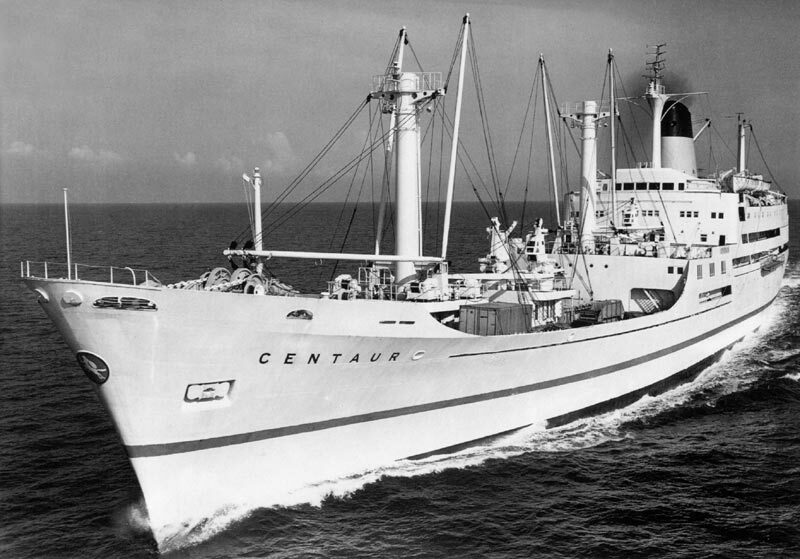 Centaur was chartered to the St Helena Shipping Company for one year, then laid up in Singapore for three years. 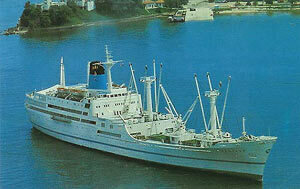 In 1985 she was sold to China and renamed Hai Long. 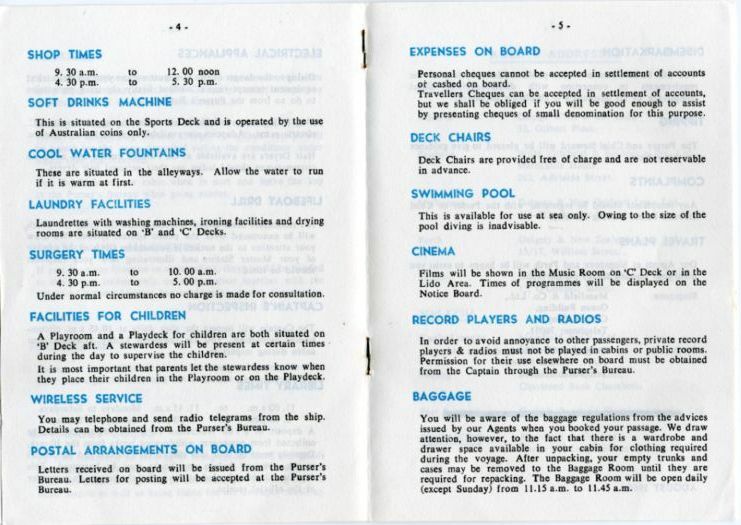 Mr, Edgar Morris from Rhiw sailed as passenger from Fremantle to Singapore on the Centaur in the mid sixties, he kindly lent us the photographs, ticket and the booklet.